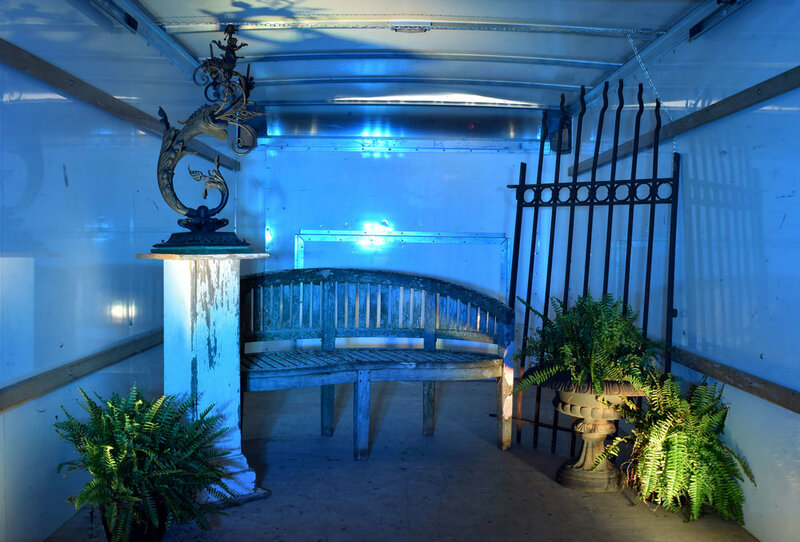 Have you ever wondered what a Gothic themed room would look like inside of a truck? Neither had we, until we spotted an article in T: The New York Times Style Magazine. 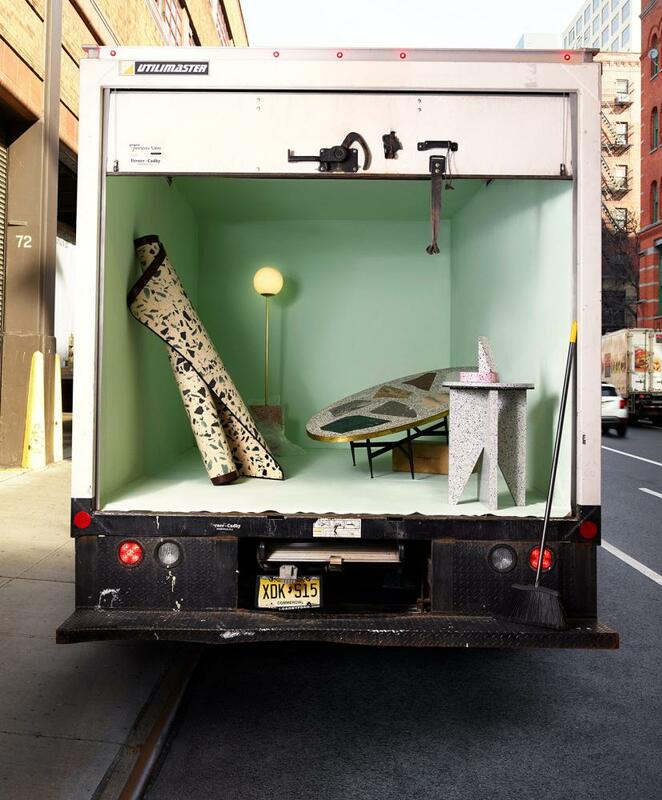 "All the Right Moves" features four scenes created within a truck in the city. Each scene, styled by Theresa Rivera and photographed by Anthony Cotsifas, has its own theme and compelling furniture and decor arrangement. Inspired by their creativity, we decided to design our own scenes within a truck right off of our loading dock. Using our own antiques, we pieced together four scenes that each represent an architectural style, and then played with the lighting inside the truck (mostly to study the effects of light in a space, but also because we like to geek out over fun light design). We love this mossy teak garden bench, and thought it would look even more whimsical next to some pieces with Victorian-esque curvilinear lines. While it wasn't our original intention to create a magical garden scene, we couldn't help the urge to throw in some ferns. Light played a dramatic role in changing the appearance and the story behind this scene. The light green light makes the foliage and the moss on the bench pop, and creates a warm, welcoming atmosphere. On the other hand, the purple light reminded us of a foreboding garden outside of a mansion, where a murder mystery would take place. Both images feature the same antiques, but communicate very different moods. Our industrial antiques seemed to be made for this truck photo shoot. The various angles, heights, and shapes of the pieces all come together to make an exciting, yet harmonized scene. The reflective antiques made the biggest difference when it came to lighting, since every glass and metal surfaced picked up variations of the projected colors. This might have been our favorite set up (although we shouldn't play favorites). The heavy, ornate wood, glorious stained glass windows, and touches of wrought iron truly brought us into the twelfth century. We especially loved the power of the deep purple lighting, since it contrasted the bright windows, and brought out the burgundy velvet in the carved wooden chairs. Can't you just picture a French poet brooding over that impressive desk? This cozy fireside scene perfectly depicts common indicators of the Craftsman style, such as geometric lines, handcrafted pieces, and wooden furnishings. We thought it was interesting that even though we cast white light on the scene, the wooden surfaces seemed to emit a warm glow. Want to complete your own themed room? Visit our product page to find the antiques perfect for your space!